Infinite success – From left, client manager Greg Houston, accounts assistant Gail McShane, practice manager Tracy Cowie and Simon Cowie, managing partner at Infinity Partnership. Infinity Partnership has won at a national awards event in London for the third time in three weeks. The Aberdeen-based accountancy and business advisory firm won four awards at the 2018 IRIS Customer Awards – just weeks after winning at the British Accountancy Awards and the Accounting Excellence Awards. 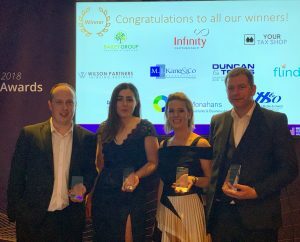 At the Iris Customer Awards, Infinity landed Medium Firm of the Year and Bureau/Outsource Service Firm of the year, while client manager Greg Houston won Accountant of the Year. Gail McShane, accounts assistant, won Graduate/Trainee of the Year. Infinity was also shortlisted in the Practice Manager, Client Excellence, Advisory and Partner of the Year categories. Infinity won the Independent Firm of the Year (Scotland, Northern Ireland & North England) for the third time in four years at the 2018 British Accountancy Awards. It was also shortlisted in two other categories. The business won the Small Practice of the Year accolade at the 2018 Accounting Excellence Awards. IRIS is a leading accountancy software provider.